Below is a list of upcoming events that relate to Indigenous Economic Development, as well as organizations that host these types of events. Please note they are listed for convenience, may not be open to the general public and are not necessarily endorsed by NACCA. INDIGENOUS WORKS AND ITS’ CO-HOSTS, THE NATIONAL ABORIGINAL CAPITAL CORPORATIONS ASSOCIATION (NACCA) AND THE COUNCIL FOR THE ADVANCEMENT OF NATIVE DEVELOPMENT OFFICERS (CANDO) ARE PLEASED TO EXTEND THIS INVITATION TO YOU! This Discussion Forum will provide information, invite dialogue and explore strategies by which retail businesses and the retail industry can be encouraged to develop successful engagements and partnerships with Indigenous people and communities. 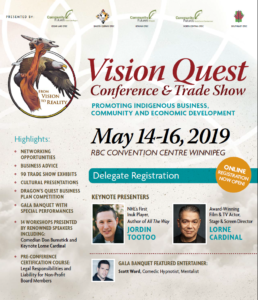 The purpose of the dialogue is to explore ways to create the relationships and conditions needed for successful Indigenous employment and workforce development, business and social development. Join us along with 100 other invited guests from industry and Indigenous organizations as we share information and exchange ideas and strategies to work together. This year's theme was Access to Capital - Unlocking Community Potential. Our sincere thanks to all those who participated and helped make our inaugural Forum a huge success. We also wish to recognize and thank the Government of Canada (ISC & ISED) for their financial contribution. Visit the Forum page here. Specific dates and more details as they become available. NationTalk is Canada's Premier Aboriginal newswire, employment, event and tender service. NationTalk has been the voice for Indigenous employment, event, tender and media opportunities since 2005. The Business Development Bank of Canada (BDC) is the non-Indigenous version of NACCA. They help create and develop strong Canadian businesses through financing, advisory services and capital, with a focus on small and medium-sized enterprises. They have a subsidiary called BDC Capital, which is similar to NACCA's planned Indigenous Growth Fund. FuturPreneur is a community of entrepreneurs and experts, sharing practical advice, business tips and lessons learned. AFOA Canada offers a wide range of professional development opportunities through online learning, publications and workshops. The CCAB's mission is to foster sustainable business relations between First Nations, Inuit and Métis people and Canadian Business. Throughout the year, the CCAB hosts multiple events at various locations and dates. Join StartUp Canada for their weekly online programs and learning webinars, explore special events live across Canada, and secure your seat for their upcoming Signature events. Aboriginal Business Match is a two-and-a-half day networking event that connects a national network of Aboriginal and non-Aboriginal decision makers to create opportunities for businesses, training, and employment. This website contains a list of events and training opportunities offered for Canadian business leaders throughout Canada. This highly specialized portal is fully-dedicated to assisting individuals interested in locating and attending conferences and events of specific interest to Canada's Aboriginal Peoples. The Entrepreneurial Development Conference & Expo is an educational event which draws a roadmap to success for small business owners and managers. Currently offered in four Canadian cities for 2018.